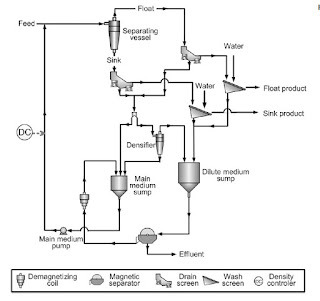 Dense medium separation (DMS) has two principal applications: the preconcentration of minerals, that is the rejection of gangue prior to grinding for final liberation, and in coal preparation to produce a commercially graded end-product, clean coal being separated from the heavier shale or high-ash coal. In principle, it is the simplest of all gravity processes and has long been a standard laboratory method for separating minerals of different specific gravity. Heavy liquids of suitable density are used, so that those minerals lighter than the liquid float, while those heavier sink. Since most heavy liquids are expensive or toxic, the dense medium used in industrial separations is a suspension in water of particles of some dense solid, ferrosilicon for metalliferous ores and magnetite for coal. The process offers some advantages over other gravity processes. It has the ability to make sharp separations at any required density, with a high degree of efficiency, even in the presence of high percentages of near-density material. The density of separation can be closely controlled, and can be maintained under normal conditions for indefinite periods. The separating density can be changed as required and fairly quickly, to meet varying requirements. Preconcentration is most often performed on metalliferous ores that are associated with relatively light country rock, such as silicates and carbonates. Lead-zinc (galena-sphalerite) ores are often pre-concentrated by DMS and it was commonly used with some of the Cornish tin ores, the cassiterite being found in lodes with some degree of banded structure, associated with other high-specific-gravity minerals such as the sulfides of iron, arsenic, and copper, as well as iron oxides. The lode fragments containing these minerals therefore have a greater density than the siliceous waste and allow early separation. The process is, however, rather expensive, mainly due to the ancillary equipment needed to clean and recycle the medium, and the cost of the medium itself, and a viable alternative is electronic ore sorting, which is increasingly being used in the mining sector in order to reduce the amount of waste processed through the comminution circuit thus boosting the overall ore grade. Last week it was reported that two tin operations are planning to use ore sorters as their method of preconcentration. Metals X and its joint venture partner Yunnan Tin have commenced commissioning of its new crushing and ore sorting facility at the Renison tin mine in Tasmania, Australia (MEI Online). The ore sorting equipment, provided by TOMRA, is expected to increase annual tin production at Renison by 15-20%, the TOMRA X-Ray transmission ore sorter expected to reject an estimated 200,000 t/y of waste at the crushing stage, upgrading the ore before the processing plant. Also reported on MEI Online, the results of the definitive feasibility study on Kasbah Resources’ majority owned Achmmach tin project in Morocco have proven favourable enough for management to push forward into development, and it looks like being another operation to benefit from ore sorting technology. The plan has the ore sorter reject rate kept nominally to 40% of new feed, which will mean the positively sorted ore from the sorter, termed the “accepts”, will report to the downstream processing circuits. The company has carried out two phases of ore sorting testwork on the project, with the second phase involving sorting two tonnes of representative ore through a full size Steinert KSS multi-sensor ore sorting machine in Perth, Western Australia. This could be great news for Cornwall, with the South Crofty tin mine revival under way. Up to its closure in 1998 South Crofty had used DMS to pre-concentrate the ore, as did the Geevor tin mine which closed eight years earlier. It will be interesting to see if electronic ore sorting is considered for the new processing circuit at South Crofty, and hopefully we may find out more at Physical Separation '19 next year. Both TOMRA and Steinert, the leading players in sorting technology, were major sponsors of Physical Separation '17, and I am sure they will be at next year's event with updates on this increasingly important technology. The latest news on Physical Separation '19 can be found at #PhysicalSeparation19. DMS has an interesting background. Of course it's an efficient method, but it's growth in the 60's 70's and 80's was proliferated by DeBeers/Anglo American who were in bed with the magnetite and ferrosilicon producers. The technology was then transferred to copper, COLTAN and other metals. With mostly success, some failures. The older gravity methods fell by the wayside to a large extent. You have pointed out some of the expense issues, but there are also technical issues, such as high clay leading to reverse concentration, high maintenance, etc. Any mineral engineer or operator who has used DMS will tell you about nightmares connected with the DMS preparation (pre-washing) necessity. To now go to ore sorting is perhaps a technology going to the next level of complication, cost and issues, whether by photo analysis of minerals in the stream or X-ray fluorescence, etc. DMS may effectively be used to 2mm. Imagine a 200 tph stream of ore on a sorting environment. Since this article is actually directed at Cornish tin and I'm a Cornishman myself.... I would propose the old methods (vastly improved by the Chinese over recent years) are the way to go. Jigging with no ragging and sluices (but VIBRATING sluices) - SIMPLE, CHEAP, no feed preparation involved AT ALL after crushing, except scrubbing if necessary to ensure particle liberation from clays (and there are simple cheap methods for that) and very easy to operate. There are however various (quite simple) tricks that have been developed over the last ten years by small and medium size operators, making concentrate removal (for example) a breeze. I'm sure that because TOMRA and Steinert, the leading players in sorting technology, were major sponsors of Physical Separation '17, and I am sure they will be at next year's event with updates on this increasingly important technology, but not be supporting retro methods! It is all about texture. Ore sorting is spectacularly effective for the cassiterite at the San Rafael tin mine in Peru because the cassiterite is present as large balls inside gangue, few particles have tin in them. That makes it incredibly easy to sort based on xray transmission. Other ores that are disseminated have washability curves similar to DMS. Planar textures just don't work well. Ore sorters are growing with computing power, but treating fines at higher tonnages is still a distant dream. I feel the main factor to consider is the size at which the minerals are liberated; even if a major portion of gangue gets liberated at coarse size, one may consider "ore sorters" as rougher. For me ore sorter is not a complete alternative to heavy media at industrial level if liberation(complete) is at middle and finer sizes(i.e.-30mm). I agree with Dr Rao. Ore sorting is complimentary by no way competitive to technologies like DMS and Pre-Concentration with jigs. The particle sizing is the determining factor, but with the ore sorting at plus 15 mm and the jigging minus 15 mm they are definitely technologies that can work together. Agree! It's the future. Particularly if installed UG in LG IRGS deposits (if Ore amenable to sorting). Short answer would have to be no as they both have their place. The advances in ore sorting technology certainly means it is time for process design engineers to reconsider it. A case I have seen (desktop study based on pilot plant results) showed a eight to one concentration ratio achieved on the +10mm -50mm crushed fraction of an ore body where the valuable mineral was in veins through a high work index host rock. This turned a sub economic resource into a highly profitable one. Instead of thinking about the latest trend we should be thinking about the most economic and environmentally secure technology. Ore sorting was the first mineral processing method ever used so it passes the test of time. There have been far too many plants built with the latest trendy technology, or even worse, the only one that the designer knew, that were economic failures. DMS is highly underappreciated, or even unknown, outside of coal in the Americas. Now we all wait for 20 juniors to use ore sorting before a major steps in and the world declares it to be "established technology". Ore sorting progressed rapidly over last few years and will be here to stay. However, we have to be careful stating it will replace DMS. I would rather say ore sorting is becoming more and more an attractive alternative (both technical and economical) to DMS depending on the ore characteristics of the project/plant. XRT ore sorting will find it's place in the future among all other technologies. It is not a "one-size-fits-all" technology, but it can be an excellent alternative for DMS or jigging. Often the grade of a rock (small inclusions of e.g. tungsten or galena or other sulfides) can even be "seen" without crushing it to a liberation size where gravity-based technologies start to function. That saves a lot of crushing or transport cost, even without any water, for instance close to the mine face. Technically XRT-sorting works well between 8 mm and 150 mm (in Diamonds even 4 mm or larger). Economically it always depends on the individual circumstances and sorting objectives: Particle size, feed rates, grades, liberation, water access, permitting issues, environmental considerations, and finally cost per ton. These, at sizes +20 mm, usually are much lower that those of a DMS. Therefore, nowadays XRT-Sorting replaces even existing DMS plants in various applications. Ore sorting been around a long time as in "hand sorting". I believe it has its place and must defend itself in ore recovery vs losses, be cost effective and environmentally competitive. 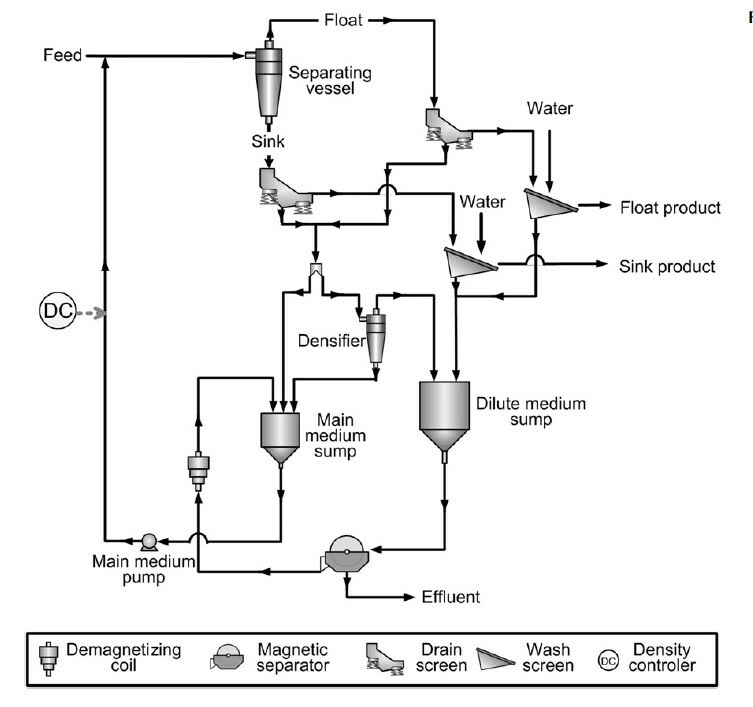 I would like to know if anyone would have comparative values of capital and operational costs of these techniques (ore sorting and DMS) to send me (my e-mail: dimasjneto@usp.br). I am developing my dissertation comparing ore sorting and DMS to brazilian zinc ore and I would like to compare the costs between both techniques. Dimas Neto, University of São Paulo - USP, Brazil. Sorter separation using XRT, NIR or other means is now well established and proven in industry. The technology has been proven on multiple diamond plants (notably, but not exclusively Karowe) and has been largely responsible for the increase in large diamond recoveries over the last few years. Many other minerals are also well proven in practice. We have designed and successfully commissioned large scale sorting plants down to 4mm over fixed size ranges, however throughput is limited in the finer sizes. As such, there will always be a place for the DMS on the finer size ranges. Top size of sorting is typically limited to the liberation top size, but we have successfully installed/commissioned -200mm sorting plants. Feed rates of +200tph per machine are feasible in the coarser size ranges. Diamond discrimination at these capacities is exceptional allowing only the final hand sorting of concentrate thereafter. Feed preparation for DMS is important, but it is equally critical for a successful sorter project. Of interest, De Beers have also recognized the potential of this technology and have also developed their own sorting machines which are also available on the market, in addition to Tomra and Steinert. As another variant to consider, it is also possible/feasible to install tailored XRT sorting down to 1mm subsequent to a pre-con DMS. Excellent discussions in a very focused manner with explanations; I wish we have more of this nature. Very useful for new ventures. Ore sorting may be useful for coarse particles, but when we have to deal with finer particles below 1mm down to 0.5mm, not sure whether they are as efficient yet. The most important issue is that sorting really only starts working at production volumes in the size range above 10 - 20mm. This excludes a lot of the ROM ore from the process. It the becomes a question of liberation and at what size distribution do you see acceptable liberation. Typically between 25 - 60 % of all ores will bypass the sorting process due to size distribution depending on the mining method. DMS will work on material down to 0.5mm and gives the best EP separations of any gravity device. This really sets it apart where low sp.gr differential separations are needed at the sizes best approaching liberation point. I don’t think it will be replaced but I do think the more technologies available to us and the more combinations we have to bring together the better our chances of success. We must basis at ore properties and mineralogy. If you sorting sulfide ore that has low grade sulfides – sorting is better. Real example. We did test work with TOMRA, Steinert and DMS. Gold associates with sulfides. 50% +20mm material is presented lumps with 1 or 2% sulfides (size of one sulfide ~2mm). XRT sorter able to recognize so kind sulfides. Density of waste is 2.7, density of sulfides ~5. What is size of DMS feed if required distinguish density between sunk (with sulfide) and float (without sulfide) lumps is 0.3? But gravity concentrators is fed -2. We don’t need pre-concentration for this stage. Also, as rule, fine of gold ore (-20/10mm) has grade 1.5-2.0 higher than ROM (without pre conc).